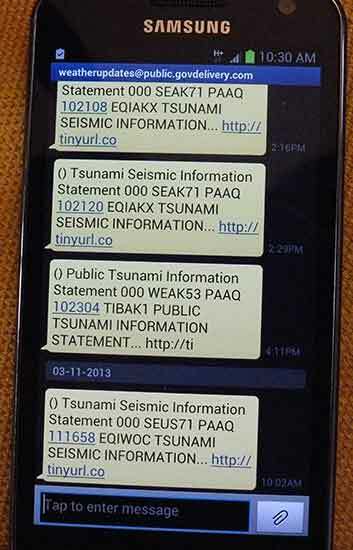 For the past month, text message tsunami warnings from the West Coast and Alaska Tsunami Warning Center have transformed from clear, concise vital information to incomprehensible computer code with a link to a useless URL–at least on my Bell Android Samsung phone. Take the warning for this morning’s 4.7 magnitude earthquake which shook southern California. The Los Angeles Times is now reporting there have been more than 100 aftershocks from the quake. My phone beeped this morning with the tone that let me know that this was a possible tsunami warning. This is what appeared on my phone. This is what appeared on my Tweetdeck feed. The SMS text message is completely useless. Not only is there no vital information, it directs you to tinyurl.co, which (if the URL is not truncated) usually reaches the homepage for the Tiny URL website. On other times clicking on a link goes to a spam like, buy this domain site, tinyurl.co which is even worse. 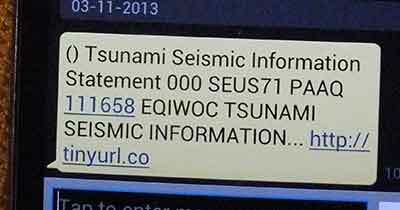 I began subscribing to the WCATWC warning messages on my phone the day after the October 27, 2012 earthquake on Haida Gwaii. From October until mid-February, the messages on Twitter and on my phone were identical. Then in February everything changed, perhaps because NOAA, the US National Oceanic and Atmospheric Administration, changed the transmission servers. Although it is not clear why simply changing a the outgoing server would have any affect on a message that the US and Canadian federal governments and the state and provincial governments along the west coast consider vital public information. Here are the latest messages as they appeared on my phone. Here is how the same warnings appeared on Tweetdeck. 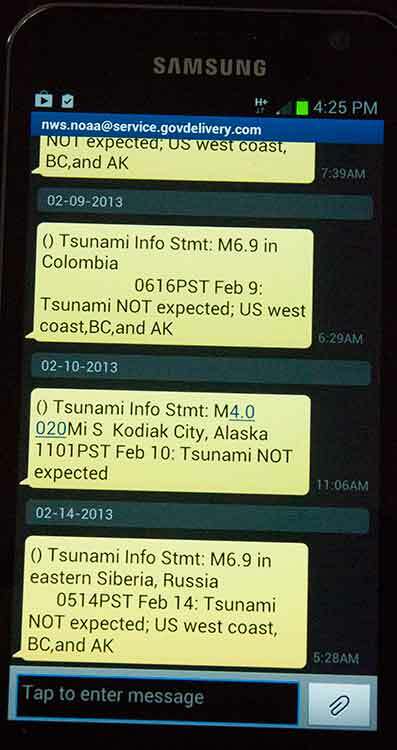 According to my phone’s text message log, the last clear message about a possible tsunami was received on February 14 from the server nws.noaa@service.govdelivery.com. All the gobbledygook messages since then have come from weatherupdates@public.govdelivery.com. Here is how the tsunami warnings appeared on my phone prior to the server change on Feb. 14. Perfectly clear, telling what you need to know. This problem should be fixed as soon as possible. A spokesperson for the tsunami warning center could not be reached for comment. A somewhat related issue to the failure of the SMS messages from the tsunami warning center is Twitter’s (in my view completely stupid) decision last week to kill Tweetdeck for the Android and Apple phones. I have always followed earthquake and tsunami warnings (as well as other breaking news stories) using Tweetdeck for both my desktop and my phone. For the past month, as soon as I’ve heard the tsunami alert on my phone, I have gone straight to Tweetdeck, ignoring the bad text message. Twitter which bought Tweetdeck last year, now wants to force users to their own mobile apps and to use the Chrome version on the desktop. Frankly, the Twitter app for the Android was and is awful which is why I kept using Tweetdeck and will do so until Tweetdeck is killed by Twitter. I do use the Twitter app for my iPad and I don’t like it either. Unlike Tweetdeck, neither app has the flexibility that I require as a journalist. With Tweetdeck, even on a phone, you can call up specific topics quickly and switch back and forth. discontinuing our app support is a reflection of where our TweetDeck power-users are going. Over the past few years, we’ve seen a steady trend towards people using TweetDeck on their computers and Twitter on their mobile devices. I have to wonder what kind of power users Twitter is referring to. Many journalists (and activists and politicians) reacted to the decision with horror. One blogger, Mike Issac, recounted his frustration with Tweetdeck in “Why Twitter Killed Tweetdeck for AIR, iPhone and Android.” I agree Tweetdeck could be buggy at times, but in my view, Tweedeck worked a lot better than Twitter’s own apps, period. There is speculation that Twitter, which has to make money, of course, wants to drive users to its own apps so it can load advertising on the feed. That’s a legitimate business decision. For years, Tweetdeck has been the go to software for tracking emergencies and breaking news. One has to wonder if any of the California-based employees of Twitter got the same garbled text message that I got and where they went to get better information. The real test of Twitter’s programs will not how much they are used for gossip, but how they work in an emergency or a disaster.